The war years left a mark on me that I’m still trying to come to terms with. The age-old questions of evil and the suffering of the innocent are never so boldly shouted, I think, as in situations of war. I cannot fathom how, in 2012, after centuries of war, genocide and mass murder, modern cultures cannot come up with another way of resolving conflicts. I don’t think you ever get over seeing innocent children maimed and killed by war and the effects of war. After that experience, I had to return to the U.S. to try to somehow come to terms with it all and make some semblance of “recovery” from it. MARYKNOLL MISSIONARY AND FORMER CATHOLIC WORKER MARJ HUMPHREY HAS BEEN DOING GOD’S WORK FOR MORE THAN 30 YEARS, OFTEN IN SOME EXTREMELY DANGEROUS PLACES IN THE WORLD. ONE OF HER FAITH HEROES WAS DOROTHY DAY, WHO OF COURSE IS ONE OF YOUR FAVORITE BLAWGER’S FAITH HEROES. SEE INTERVIEW WITH HUMPHREY IN WHICH SHE WAXES WISE ON THE COMPLEXITIES OF AFRICA, WAR’S DISASTER AND MORE. What we would like to do is change the world—make it a little simpler for people to feed, clothe, and shelter themselves as God intended them to do. And to a certain extent, by fighting for better conditions . . .
As one who considers Dorothy Day one of his faith heroes, I’m always reading articles about, and articles and essays and books authored by, the Catholic Workers or CW alums. I have friends who are now or who have been Catholic Workers, and once spent a Christmas holiday week at the CW House in Houston for an article I wrote for a Christian publication. At some point a few years ago I read something about the work that the Maryknoll missionary Marj Humphrey, who was a friend of Day, was doing as a physician’s assistant serving the poorest of the poor. So I was pleasantly surprised to come across an interview with her after being honored by Gonzaga University. Here’s a few quotes from this courageous and committed Christian soldier (Christian Pacifism Div.) about the complexities of Africa, about war’s disaster and how kids with HIV helped her find healing in her own life. Or, if you want to read the entire, quite interesting interview with her . . . .
click here for the whole enchilada. INTERVIEWER: How would you sum up your 17 years in Africa? HUMPHREY: I heard that a missionary in East Africa once said, “When you have been in Africa for a year, you can write a book. When you have been there five years, you can write a chapter, and when you have been there 15 years you struggle to even write a paragraph.” That is kind of where I am at with it. The longer you are there, the more complex you realize it all is, and you don’t even know where to begin in order to do justice to people there. “Africa” is a continent with more than 50 countries. The country of Kenya alone is home to 49 different tribes, each with its own language and culture. The Sudan, where I also served when that country was still embroiled in war, is huge, and very complex and tragic. Their more than 35-year civil war is often portrayed simply as a “holy war,” the Christian South against the Muslim North. But isn’t it really mostly about oil and greed and power? And within the Southern Sudan, there were multiple factions also fighting one another. There were atrocities by the Sudan People’s Liberation Army (SPLA) as well as the Khartoum government, like the forced conscription of 11- and 12-year-old boys into the army. One of our nurses had her 11- and 12-year-old sons taken out of their beds at night. Our area was also raided a number of times by Joseph Kony’s Lord’s Resistance Army. They abducted some of the girls from our little mission school. The LRA was working with the Khartoum government at the time. INTERVIEWER: That violence must have been terrifying. The war years left a mark on me that I’m still trying to come to terms with. The age-old questions of evil and the suffering of the innocent are never so boldly shouted, I think, as in situations of war. I cannot fathom how, in 2012, after centuries of war, genocide and mass murder, modern cultures cannot come up with another way of resolving conflicts. I don’t think you ever get over seeing innocent children maimed and killed by war and the effects of war. After that experience, I had to return to the U.S. to try to somehow come to terms with it all and make some semblance of “recovery” from it. I was having terrible nightmares and [post-traumatic stress disorder]-like symptoms. Yet at the same time, I felt terribly guilty for leaving for a time. I was the privileged person who had choices and could leave. I remained in the U.S. for three years after the wartime experience, and then returned to Kenya. INTERVIEWER: How were you able to go on? 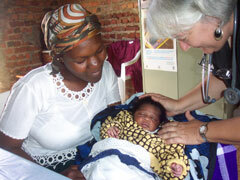 HUMPHREY: Amazingly enough, it was children suffering with and dying from AIDS who healed me. Their courage and ability to love and enjoy life, in spite of tremendous personal suffering, really restored my hope and faith in humanity and God. INTERVIEWER:What were the Africans’ gifts to you? They taught me many things — to laugh at myself and to be patient. There is a Swahili proverb, “Haraka haraka haina baraka,” literally meaning, “Hurrying things is not blessed.” They taught me to take things slowly, listen and spend time with people and answers to problems will come. Relationships are their primary value — relationships with family, friends, neighbors, one’s ancestors and with God. 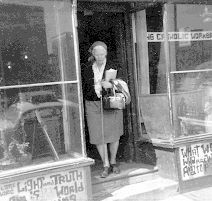 DOROTHY DAY, WHO GAVE UP THE BOHEMIAN LIFE SHE SPENT WITH WRITERS AND ARTISTS LIKE EUGENE O’NEILL, CONVERTED TO CATHOLISM AND LEFT THE SOCIALIST PARTY (AND ALL POLITICAL PARTIES!) BEHIND TO DEVOTE HER LIFE TO SERVING THE POOREST OF THE POOR WITH “RADICAL LOVE” BY STARTING THE CATHOLIC WORKER MOVEMENT. One has to wonder if Marj Humphrey may be suffering from PTSD. I do admire people that give so much of themselves to help others and marvel at the same time how they do it – how can they hold up under such stress? I know someone like that; he helps others with his words and deeds and has spent a number of years as a hospital Chaplain – dealing with grief, anger, and other emotions galore. Sometimes he was even cursed by the very people he was trying to help, yet stayed calm and strong under this pressure. This very same man has helped me more than once when I was having emotional difficulties. I’m speaking now of the Rev. Paul McKay, the author of this blog. Thanks Rev, it is appreciated more than you can know!
. And yes, every chaplain has been cursed out royally by somebody in grief who had nobody else to curse at in their grief. It happens.